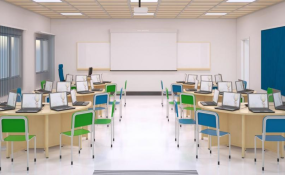 An artistic impression of a smart classroom with laptops. Education ministry was Friday facing major challenges in secondary school placement only a day after it banned principals from admitting Form One students directly. For instance, the ministry was grappling with cases where some Kenya Certificate of Primary Education (KCPE) examination candidates were yet to be admitted to any secondary school despite posting impressive results. The ministry was also confronted with cases where some candidates had been admitted to schools of the opposite gender. According to a Mr Charloz Okisai, a parent in Busia County, his son Josephat Seth Imai who scored 381 marks has been admitted to Kapsowar Girls High School. This is after the Kenya National Examination Council (Knec) erroneously identified the candidate as a female and indicated the same in his KCPE certificate. "As a result, the pupil received an admission to join a girls' school and efforts to have the anomaly corrected have not received proper attention," Mr Okisai protested. After visiting the sub-county education offices, he was advised to identify a school of his choice. "With the new announcement by the ministry, I am afraid my child might miss the government capitation," he said. On Friday, county education officials were struggling to secure the student an admission to Butula Boys High School in Busia County. "They have told me to go to Butula Boys High School, the county director of education has also called the principal and directed him to admit my son," Mr Okisai told Saturday Nation. A similar case was reported in Nairobi where a male candidate received an admission letter to join a girls' school. Scores of candidates who sat KCPE exams last year were also yet to receive their admission letters with only a day to the official reporting date for Form Ones. The ministry came under a scathing attack Friday over the directive that warned school principals against admitting any student directly. Education Cabinet Secretary (CS) Amina Mohammed on Thursday warned that any student admitted to county, extra county or national schools directly by the principals will not access free secondary education funds. The ministry has asked headteachers who have issued such letters to recall them. "We have parents whose children have been called to national schools but they can't afford and want to move their children to day schools near their homes. The ministry needs to rethink the order," said Mr Njuguna Kawanjiku, Mweiga MCA, Nyeri County. By yesterday, scores of parents expressed uncertainty over the fate of their children who had secured admission to schools other than the ones they were admitted to. They complained that the directive will adversely affect the poor and those who want to transfer their children for medical and emergency reasons. Kenya National Union of Teachers (Knut) Tharaka-Nithi County branch executive secretary, Njeru Mutani said most parents in the villages prefer taking their children to nearby schools where they can pay fees through foodstuff or offering labour. He accused the ministry of coming up with directives without involving stakeholders. "We are surprised with the kind of policies that the ministry is issuing nowadays," said Mr Mutani. South Imenti MP Kathuri Murungi said the directive was adding frustrations to students who had missed their schools of choice. "I have been getting needy students admitted to our local schools. The directive will kill so many dreams. The ministry should just request schoolheads to forward details of extra students who did not appear in the ministry website's and have been admitted in their schools," Mr Kathuri said. School principals in the North Rift region said it would be a challenge to heed the ministry's directive on Form One admission. "The ministry should not interfere with affairs of the schools. The schools have stakeholders like parents and individuals who contribute hugely to the welfare of schools and when they ask for a chance, they should be given a chance," said a Principal from the region who requested anonymity for fear of victimisation for challenging a ministry's directive. West Pokot County Knut secretary Martin Sembelo said the directive has affected students whose parents had already obtained letters to join schools other than the ones they have been placed to. "The directive by the CS to outlaw admission letters obtained directly from principals is ill-advised. That is infringing on the rights of our children," said a parent in Kabarnet, Mr Richard Chepchomei. Kisii Kenya National Union of Teachers executive secretary Joseph Moguche said the order curtails the freedom of students to join their preferred schools. "While the order may sound good, it is worth noting that parents and learners should be given room to exercise their rights. There are reasons why we have choices," he said. In Busia, local Knut executive secretary Mark Oseno warned that the directive would work against candidates who did not get admission letters even though they performed very well. "Today I visited some secondary schools and head teachers have alr eady issued letters to deserving students with requisite marks but were not admitted to any school. Where should they go yet they didn't obtain any notification from the portal?" asked Mr Caleb Opondi, Knut executive secretary Migori branch said the directive will hamper admission especially in "small schools."